Since I finished reading two books within a week or so of each other, I thought I’d review them both in one post. So here goes…. I saw this paperback at Costco, and knew it was going to jump into my cart, so I did nothing to try and stop it! This is the fourth installment of “The Clifton Chronicles” and yes, I’ve read them all. This one was, to me, more of a mystery novel than the previous three. As you may (or may not) know, I’m not usually into mysteries at all… I normally leave those to the hubby, who eats them up like good Cadbury chocolate 🙂 However the story started out three books ago, as more of a family saga type book. From Archer’s website: This series is a thrilling episodic saga of love, loss, betrayal, and ambition from the #1 worldwide bestselling author and master storyteller, Jeffrey Archer. I enjoyed catching up with the Clifton and Barrington families, but I still do not feel a strong propensity for mysteries. I’m pretty sure the fifth in the series Mightier Than The Sword (which came out in hardback at the end of Feb) will again lean towards the mystery side, and I probably won’t be purchasing it. I might try and nab it from the library, though. 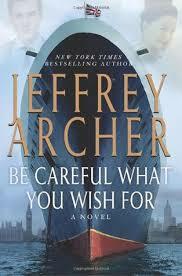 I’ve read other books by Jeffrey Archer and have honestly enjoyed them all – the man can certainly weave a tale! I saw this book on the news stand at the Palm Springs airport recently. I picked it up and looked it over thoroughly before reluctantly putting it back on the shelf. I think it was $14 and I knew I wasn’t going to spend that much on a book I didn’t “need”. Lucky for me, I was able to check this out from our local library, right on to my kindle! Yay! 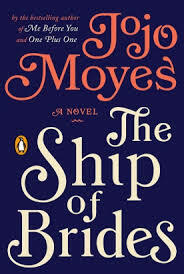 I have read several of JoJo Moyes’ novels and so far have loved them all. This one was so good and so entertaining and beautifully written. Set in the summer of 1946, we follow four of the 650 Australian brides that were placed on a British aircraft carrier and taken to their English husbands. Oh how I love a good piece of historical fiction that is based on fact!!! You might think that the real story would commence after the ship of brides arrived and began their lives anew in a foreign land…. but no. This book encompasses only the journey, which took 6 weeks from Sydney Australia to Plymouth England. The four brides we follow most closely come from completely different walks of life. They were thrown together as bunk mates, and it was quite an adjustment. While I know this book is fiction, I believe it probably holds very true to the conditions on board, as well as the strained (in some cases) interpersonal relationships, and the fears of the unknown that lay ahead of them. Highly recommend this one if you like historical fiction, particularly set in the 1940’s like I do. I also highly recommend JoJo Moyes as an author! She wrote another book I absolutely loved, Me Before You. Without a doubt I’ll be reading more by this talented English author! This entry was posted in Books 2015 and tagged book review, books, books 2015, Jeffrey Archer, JoJo Moyes. Bookmark the permalink. ← Polo in the afternoon…..